Did you know a media room installation doesn’t have to be in a clients’ living room or basement? There is no need to limit yourself when there is a world of high-end options for you to elevate your spaces with. You can completely transform a homeowners’ upstairs bedroom or vanity area with top-notch audio video features. You can guarantee they start their day off in a space that especially crafted to their needs. A Seura smart mirror or smart mirror TV is the perfect solution to upgrade any space. In this blog, we will explore how these products elevate your clients’ space and creates elegance and efficiency in their day-to-day routines. Read on below to learn more about this advanced technology and how it can play a daily part in a homeowners’ life – and why it’s perfectly suited for your next Charlotte, NC smart tech installation. Seura products have a distinctly futuristic feeling to them. They bring you and your clients the best in state of the art technology is all about making day-to-day life easier than ever before. Therefore, a smart mirror installation is a great solution to recommend to clients. By installing one in their bedroom or vanity, they can immediately stay on top of their day before it has even begun. A smart mirror can display a user’s schedule, upcoming appointments, the day’s weather, messages from family and friends, and any social media app. But those are only a few of the options – the best part, is that a smart mirror is entirely customizable. After you’ve installed one, your clients can decide exactly what they want to see on it every morning. With activated voice control, they can get ready and use the mirror without even lifting a finger. And by integrating the rest of the home’s smart technology with it, they’ll be able to manage other features as well. They can check on the security system’s surveillance footage, dim the lights downstairs, and lock the doors. It is so much more than just a mirror, it becomes a smart home control center that’s easily accessible right at the start of the day. Check out below how easy it is to utilize a smart mirror. The second form of a Seura smart mirror is the smart TV mirror they offer. These mirrors are great for any area of a home as well. They are perfect for installing in a dedicated media room, in the kitchen, or again in the vanity. They blend technology and style so well, your homeowners will forget that the gorgeous display they see is also a mirror, and vice versa. The vanishing glass component of the mirror allows for a 4K crystal-clear image on the surface, and in the next moment it will appear as a regular mirror. 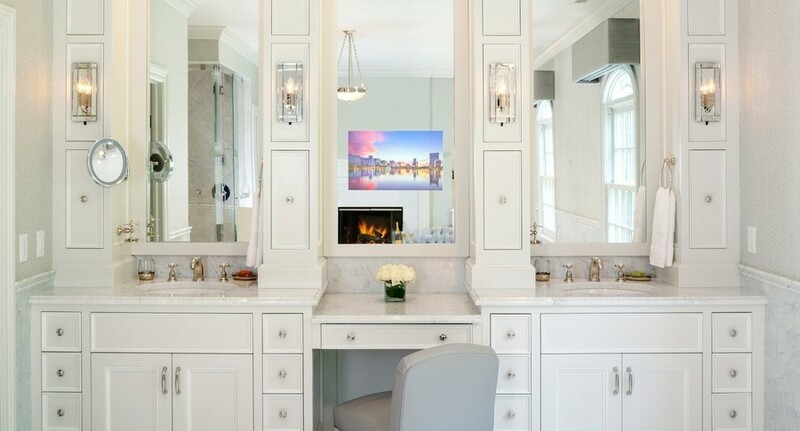 This mirror is just as easy to customize and operate for clients and even has multiple framing options they can choose from depending on where they want you to install it. Regardless of which smart mirror a client prefers, either one makes a perfect addition to any media room installation. Want to learn more about these Seura products? Feel free to give us a call or fill out our online contact form. We’d love to hear from you.